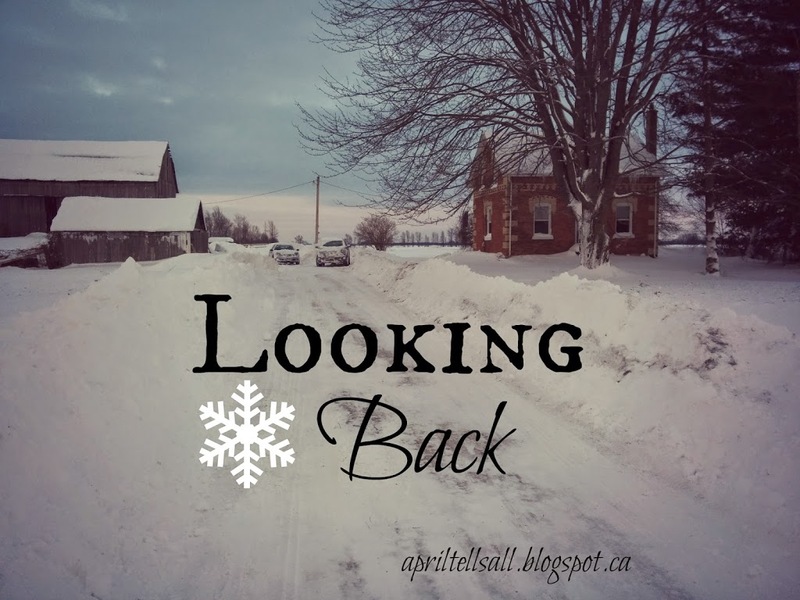 Starting on January 6th 2014 there was a blizzard that blew in to our little region in Ontario and had Hubby and I snowed into our house for 3 days. The snow accumulation was incredible in such a short period of time, and for most of the time when we looked out the window all we could see was white. 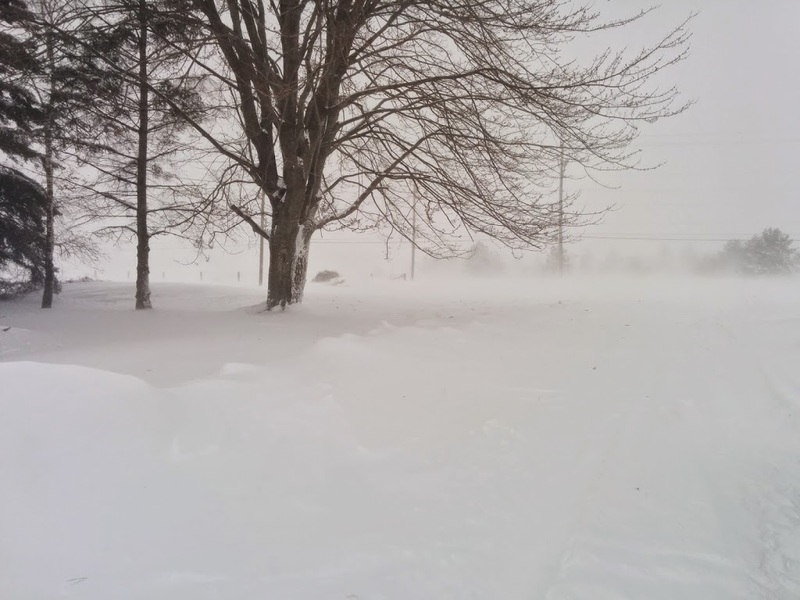 We couldn’t even see the barn, which happened to be where all our wood was stacked. 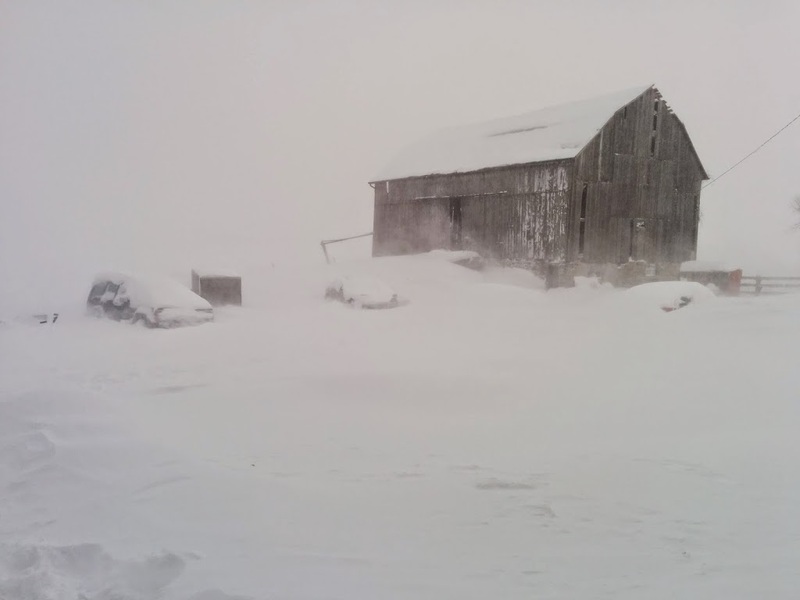 On day two as the snow piled up and the wood dwindled down we began to get nervous about going out in the snow and incredible winds to attempt to find the barn and bring in more wood. Stupidly on our part we didn’t think to pray about it. Thankfully God is good. There was a break in the snow and the wind calmed enough that we could see the barn and bring in enough wood to last us another couple of days. 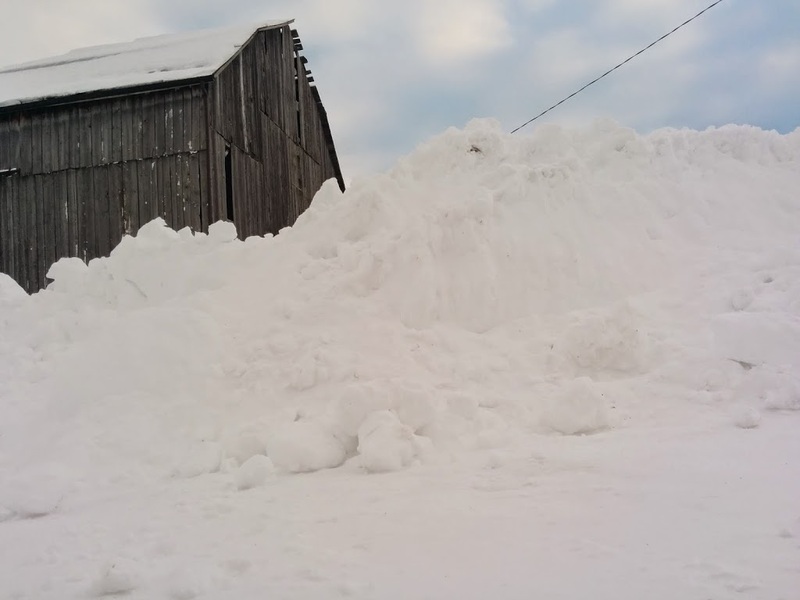 The drifts that had piled up in the driveway were unreal and just walking to the barn was exhausting, let alone bringing wood back with us to the house. But we did it. And amazingly when we had enough wood piled in the house the wind picked back up again and once again the barn was gone from view. During the small break in the storm. That blizzard was totally amazing. It was three days that Hubby and I got to spend together talking about how we wanted our future to be, playing cards, video games, and sitting by the wood stove, while the wind howled outside. We had the radio on for the majority of the time to hear what was happening in the outside world. Highways and roads were shut down, plows were pulled off the road, police were going out on snow mobiles to rescue people who were stuck in their cars along roadways, people were being urged to stay at their work place because it was too risky to be out on the roads, and some people even lost their hydro. I truly feel we were being watched over the whole time. Our worst situation happened when the snow piled up on the roof and around the chimney faster than it was melting and ultimately resulted in our chimney being completely covered in snow and the smoke coming back down into the house at 3 in the morning. It could have been seriously dangerous but luckily Hubby was awakened and caught it before the house filled up with too much smoke. The room with the wood stove had a door on it so we could block the smoke from entering the rest of the house, and there wasn’t a lot of wood in the wood stove. Poor Hubby, coughing and choking, pulled the wood out into a bucket and got it outside and extinguished in the snow. Our driveway and road completely gone. During those 3 days I spent a lot of time researching goats. I knew nothing about goats, except that I wanted to continue down the road of self sufficiency and home dairying was where I wanted to start. The first thing I did was try and figure out which breeds were dairy breeds. I had no idea there were so many different types of goats! Dairy breeds, meat breeds, fiber breeds, and pet breeds! From there I learned about butterfat content, personalities of the different breeds, and I made sure to do a lot of Google image searches to get a look at all these breeds. There are so many to choose from! That all happened not even a year ago. As I look forward to these next coming weeks and the start of another year I am in awe of how far we have come in such a short period of time. We have goats. I have even manged to keep them alive and happy. Me, the girl who had no idea a year ago that cashmere came from goat hair. Since we got our girls in June I’ve learned how to trim hooves, how to check for intestinal worms, how to tell when a goat is in heat, the breeding rituals of goats, how to tell a Nigerian Dwarf goat from a Pygmy goat (and sadly discovered that my wonderful Sophie is in fact a Pygmy not a Nigerian Dwarf), and I know the names of all the people at my local feed store. I’ve learned about proper bedding, deep litter, fencing, proper shelters, predators, and how if you rub a goat’s neck and chest they act just like a puppy dog. I’ve also learned that I need to relax more and let the small things go and, despite the fact that I want to be, I am not always in control. There will come a time in your life when you will be faced with a crossroads. The easy route will be the one you are most comfortable with. The hard one will not always guarantee success and could look like a down right failure. Last year during that blizzard God was taking me to that crossroad in my life. I knew what I wanted to do, but sometimes what we want to do and what we should do are totally different things. How do you tell what the right path is then? I agonized over that decision. I prayed and read the bible and sought out answers but found none. Why couldn’t there have been a verse that read: April thou shalt be a goat farmer and prosper. That would have made my life easier. Interestingly enough though I was not led to Proverbs 27:27, but in fact it was a sermon that my pastor did on David that made me almost leap out of my chair. I felt it. I can’t describe it, but I knew what I was supposed to do. That was in March, a whole two months after the blizzard. A whole two months that I spent praying, reading, seeking, and asking. Answers do not always come instantly my friend. I was made fun of for choosing this life. People thought I was crazy. People still think I’m crazy. My own family has expressed worries over my choices. But when you are on the path that God has set out for you, you just know. And when it is in His power and His timing amazing things happen pretty darn fast. There is nothing more amazing than sitting back and watching God work, and looking back and seeing how far He has brought you. Don’t worry about the storm. Don’t worry about making the right decision. Just have faith. So very true, April. Have faith and enjoy what you are doing…..everything else will fall in place. I enjoy reading your blog. Thanks so much! I’m glad you stopped by.